Establish forging machine structural dynamics and system dynamics model. The finite element analysis software MSC.Nastran is used to discretize the components and carry out modal calculation to obtain a modal neutral file, which stores all the information of the flexible body. The modal neutral file is imported into the system dynamics model. The rigid component (movable beam) is replaced by the flexible component in the MSC.ADAMS software platform, and the rigid-flexible coupling dynamics calculation is performed. From the figure, we can see that the curves P01 and P03 are symmetrical, the curves P02 and P04 are symmetrical, and the curve P02 (P02) , P04 than P01, P03 angle deflection degree. Comparative analysis and, we can see that the eccentric load caused by the force components of the position deflection, near the sudden change from the load deflection. 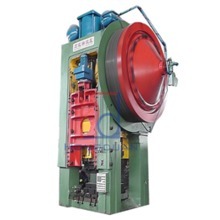 Based on the above analysis of the influence of partial load on the dynamic characteristics of forging press, it is necessary to set the synchronous balancing system of moving beam to realize the stable and reliable operation of the press. When the balance cylinder is not introduced, the curves of the deflection angles P01, P02, P03 and P04 at four orientations with time are shown as a, and the curve after the introduction of the balanced hydraulic pressure is shown as b. Comparing the data of a and b, it is found that the introduction of balance cylinder effectively reduces the influence of eccentric load on the pose of moving beam. 4 Conclusions The rigid-flexible coupling model of the hydraulic machine involves the elastic deformation of the movable beam caused by the inertia force and the impact on the overall system. In order to ensure the credibility of dynamic simulation, moving beam can not be simply regarded as rigid body. 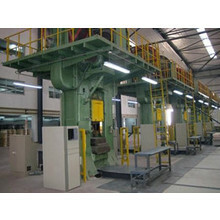 Forging machine structural dynamics analysis shows that the horizontal and vertical vibrations coexist during the operation of the hydraulic machine, affecting the rigidity and strength of the press body, reducing the life of the press. 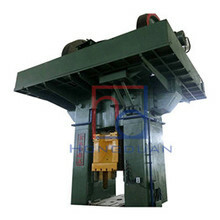 If the prestressed structure is adopted, the vibration amplitude of the hydraulic machine can be reduced, and the rigidity and strength of the component can be increased, which has a positive effect on the structural carrying capacity. Under the condition of unbiased load, due to the elastic effect of the movable beams and the vibration of the hydraulic machine, there is a stable contact force between the guide rail and the movable beam. When the load suddenly changes, especially the partial load, the contact force between the parts rapidly increases . 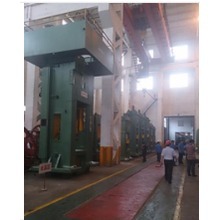 Eccentric load makes forging machine structure stress worsened, the introduction of moving beam synchronous balancing system, and appropriately increase the damping of synchronous system can effectively reduce the impact of partial load on the dynamic performance.